I love plein air painting with my friends! 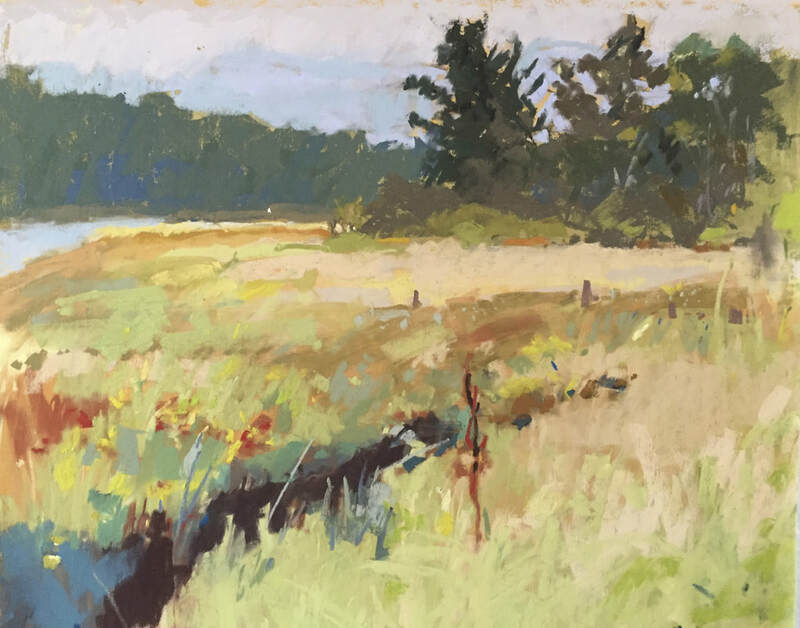 ​Where is Kate McGee Plein Air Painting? 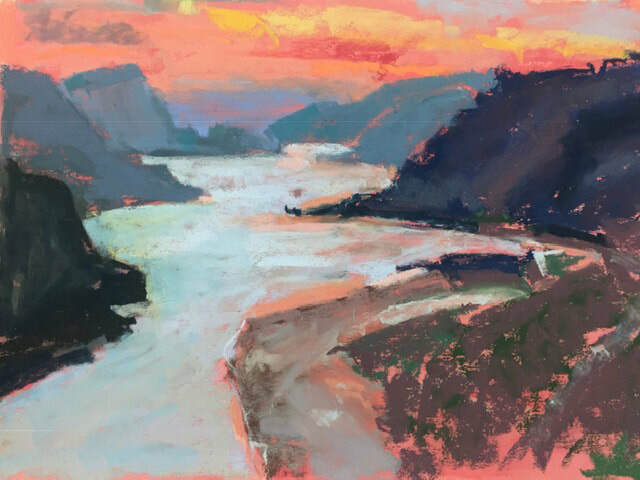 The 25th annual Yaquina Art Walk 25 and 5th Plein Air Competition take place over Labor Day in Toledo, OR. Two of my pieces were chosen for the juried show, and one won second prize. They were painted over the summer with my friend Karen Kreamer. Look for them at the Yaquina River Art Museum. ​2018 Corvallis Fall Festival Poster. The poster was designed by Renee Merritt. My work was photographed by Mike Bergen. 20 watercolor and pastel paintings by Marjorie Kinch and Kate McGee. Just walk on in and tell staff you are there to check out the art show in the back hall. will be published by Philomel in August, 2019. In this story, a mouse’s squeak sets off a chain reaction that wakes all the animals in the surrounding meadows and mountains. My sister Laura wrote the book. We illustrated it together. She painted the illustrations in black and white gouache resist then I colored them in Photoshop, as we did for Little Wolf’s First Howling. Gotta love the internet! ​ ALA Booklist, School Library Journal and Kirkus. Laura was awarded the Margaret Wise Brown Honor Book for the text. I am a contributor to this compilation book. My piece is chosen from earlier publication in Pastel Journal. My pastel landscapes are of real and imagined places. Each painting is an experiment to express an idea about place and atmosphere. They are painted pretty quickly, over a day or two, and many do not succeed. I am not patient but I am persistent. 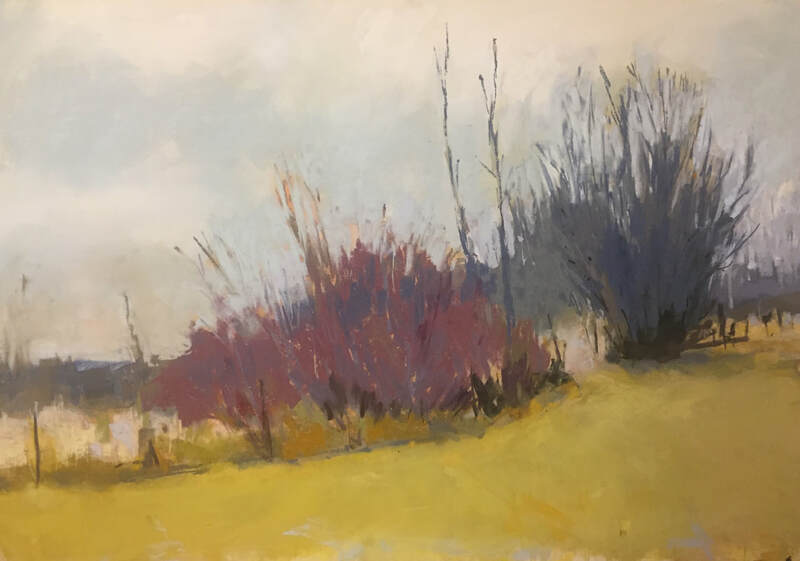 I go back to the same places to paint over and over again to record the weather, the quality of light, the reflection of water, the growth of grasses; all the changes in a place over time. Familiarity breeds understanding and a focused sense of the place so that I can express its fundamental nature simply. I have always drawn and painted. Growing up in a busy family with five kids that valued creativity in all the arts, I was the designated visual artist. Later, I chose a landscape architecture career that honed my designer's eye and drawing skills. Those years of creating three dimensional spaces, designing with shadow, sunlight, color and texture, naturally inspired my passion for painting landscapes. When I turned 50, my children grown, I decided to put in my 10,000 hours to master pastel painting. 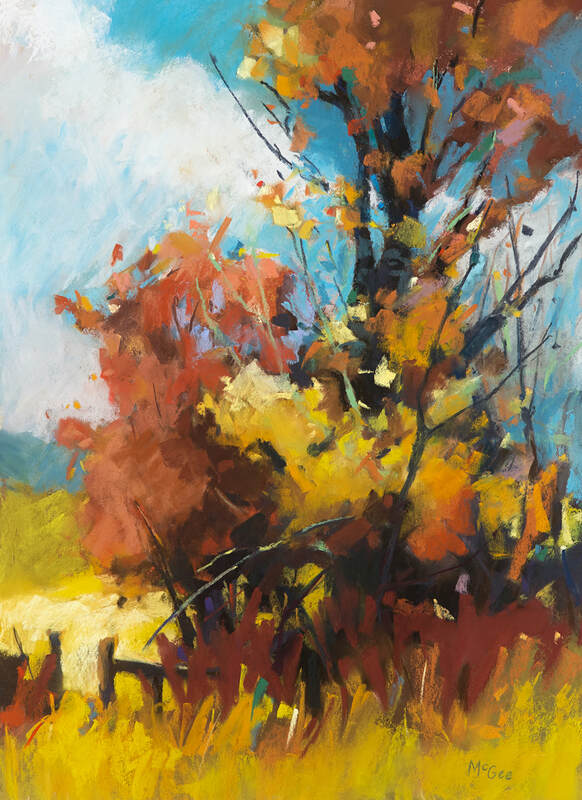 Now, some (many) years later, I've participated in juried shows, solo shows and group shows and have even been published in a national art magazine. I quit my day job and became a full time artist when I fell in love and moved to the King's Valley area in the Coast Range of Oregon, near Corvallis. JAM Fall 2014: Pastel Artist Kate McGee from SOJC on Vimeo. Students from the Jam Journalism class at the University of Oregon filmed an interview with me Fall term, 2014. Bryan Cargill, Fahmo Mohammed and Stephanie Lambirth made the experience a comfortable delight. Here is the video they made. There is also an article on the Register Guard's blog.